In the court of King Henry VIII, nothing is free— and love comes at the highest price of all. When Kitty Tylney’s best friend, Catherine Howard, worms her way into King Henry VIII’s heart and brings Kitty to court, she’s thrust into a world filled with fabulous gowns, sparkling jewels, and elegant parties. No longer stuck in Cat’s shadow, Kitty’s now caught between two men—the object of her affection and the object of her desire. But court is also full of secrets, lies, and sordid affairs, and as Kitty witnesses Cat’s meteoric rise and fall as queen, she must figure out how to keep being a good friend when the price of telling the truth could literally be her head. I wiped at the mud ineffectively. William coughed. If he started laughing again, I thought I might smack him. “It’s a lovely color on you, Kitty,” he said. Lovely color. It was a horrible color. Reminiscent of bodily functions. In spite of myself, laughter burbled in my chest. “I look frightful,” I admonished him. “Mud is a color flattering to no one.” I caught a smile creeping across my own lips. “Actually,” he said “I find secrets get in the way.” And suddenly his expression opened. Vulnerable. I could read everything he was thinking. He looked shy. And hopeful. “That’s good,” I said. “Because I have none.” None of my own, anyway. I looked away to hide the hope my own face reflected. Westminster Palace stared back at me from its empty eye sockets. I remembered what William had said before I fell into the mud. “Is it really more beautiful up close? I asked. From Lambeth, it didn’t look beautiful at all. 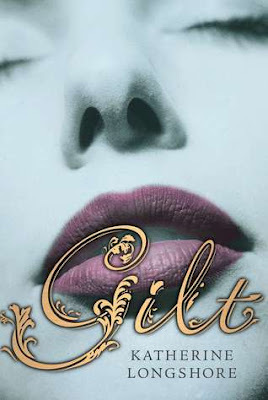 Add Gilt to your Goodreads shelves.